A recent crash wiped out the forum. Sorry. 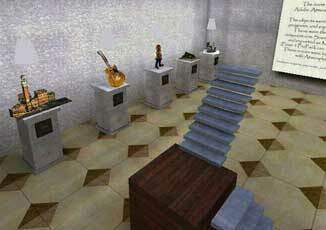 Canoma is Mac/Win software that allows fast creation of photorealistic 3D models from one or more photographs. The models are geometrically very simple, and their purpose is not to replace any CAD or detailed 3D model, but to augment it, for example with realistic 3D context or to allow very fast 3D prototyping. It was originally sold by Metacreations, which has since divested all its shrink wrap software business. Canoma was acquired by Adobe, Inc. For inquiries about the future status or availability of Canoma, you may contact Adobe directly. Currently, neither Adobe nor Metacreations are selling Canoma or offering technical support. Hopefully these pages will provide a little background to those interested and some help for previous purchasers of the software. This is an independent effort, not affiliated with either Adobe or Metacreations. I do not have Canoma copies for sale, but you can try finding one at ebay or see the news section below for a reseller who still has copies. A new utility from expert user BobMax: have you ever wanted to take an existing 3D model and load it into Canoma so you can apply realistic textures from a photograph ? That is exactly what ExportToCanoma does. Best of all ? BobMax is providing this to you free ! A new message board for Canoma is up and running - check it out please. Future news and announcements will appear there rather than here. And of course, YOU can add content to that site. This site will stay around for existing media, tutorials and links. Cost is 269 $US dollars plus post&pack (post and pack from spain is expensive a lot of USA clients send us UPS to take the packet from our office). Adobe has recently released Adobe Elements, "Son of Photoshop". 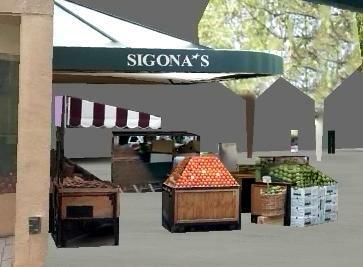 A friend of ours has written the software for stitching together images which is now part of Elements. You can create very wide angle synthetic photographs with this technique which can then be fed to Canoma. This will result in faster and more accurate modeling than with seperate images. 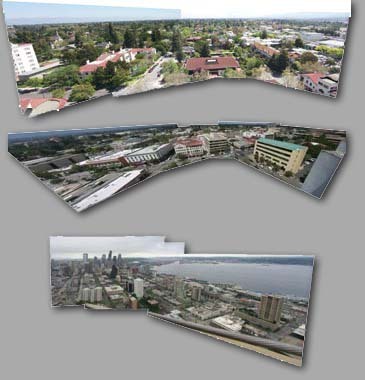 Click on the thumbnail below to see large scale versions of the images as well as a finished Canoma model of downtown Palo Alto, generated with several stitched images. and a couple of screenshots from version 2 - which was work in progress when Metacreations shut down. Connoisseurs will see an important new capability demonstrated in these: Cylinders (there was a lot more of course, but these are two screenshots that survived). Also redid the canoma.com front page to allow for more regular news updates. I updated many broken links and added new ones to most sections below. Please let me know if something is still wrong or you have a link to useful information that I should add. Check out historical reconstructions of Delft at the time of Vermeer - a project spearheaded by historian Kees Kaldenbach. See the "Made with Canoma" Quicktime movies and read how they were made. PS: true photogrammetry geeks and / or Vermeer fans should definetly also check out Philip Steadmans excellent book "Vermeers Camera"
You may also want to check out a new product that Adobe is developing, called Adobe Atmosphere. 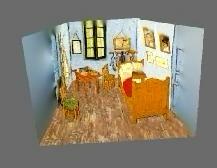 It is a immersive 3D builder and browser. You can download a free beta of the software. It is possible to import Canoma models (among many others) into Atmosphere. There is a tutorial I wrote as well as a sample world. Atmosphere is similar in its goals (as a online, multiuser 3D immersive browser) to Active Worlds and Blaxxun, both of which also can use Canoma models. If you have questions about Atmosphere, the user forum may be a good place to get answers. There are also some Atmosphere community sites. What is the "stress display" and how can I use it to make better models ? A little tutorial based on a Magritte modeling challenge. Using Canoma for editing billboards. How to model tight spaces like rooms with Canoma. Become a showman with Metastream: Surprise! Rick Schrand has written a book "Canoma Visual Insight"
Steve Shanks has a basic Canoma tutorial. 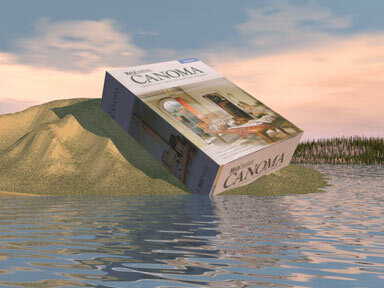 The Canoma page at the old Metacreations site, incl features/benefits, system requirements etc. A Canoma training CD, created by Matt Neutra is available: 10 hours of quicktime lessons. The website has previews of each chapter online for your perusal. 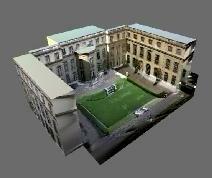 Canoma models in a live 3D multi-user world - check it out ! Look at the Virtual London and Shared Architecture projects that are part of the Designing Better Cities Initiative of the Centre for Advanced Spatial Analysis in London. They allow people to send in photographs and will make Canoma models of them for use in an online 3D environment called Active Worlds, examples in Metastream format. Greg Downing has a web page with a Canoma model of the Museum of Modern Art in San Francisco and another difficult Van Gogh ! Canoma models used in a murder scene reconstruction ? Check out "Murder on Smuttynose Island" I am not making this up. In The Campanile Movie, Paul Debevec created a photorealistic fly-by of the UC Berkeley Campus from twenty photographs using his Facade photogrammetric modeling system, which was a source of inspiration for building the Canoma product in the first place. No Canoma models here (yet?) but a most interesting program: Skylinesoft makes a free browser Terraexplorer which allows realtime flyovers over major cities. They combine satellite images (1 meter = 1 pixel, i.e. very hires) from SpaceImaging (itself a great source of Canomifiable images), digital elevation models from USGS, and sparse actual 3D models of buildings (this is where Canoma models could make things look better) If you have a fast PC and internet connection, you should check this out. Charles Benton has a rich and beautiful site on Kite Aerial Photography - his kite was also involved in Paul Debevecs Campanile Project and he created some photographs for Chris Casadys reconstruction of Pierce Ranch at Pt. Reyes. As with all images found on the net: please ask the authors for permission to use or display their materials in your projects ! As a general, great resource for anybody interested in 3D on the web, look at Sandy Resslers Focus on 3D site, full with reviews, links to authoring tools, technologies, companies etc. The artform of Trompe l'Oeil or "fooling the eye" with fake perspectives - John Pughs excellent artwork is so realistic it causes accidents ! Also check out several of Chris Casadys deconstruction examples: Picasso, Cubist Landscape, Bauhaus, Bisected Schizm . 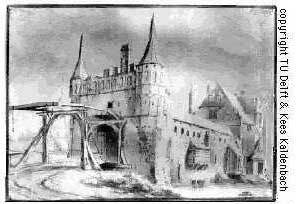 A history and reconstruction of Vermeers study by Architecture Professor Philip Steadman or, even better, the companion site to his new book "Vermeers Camera"
check out historical reconstructions of Delft at the time of Vermeer (ca 1650)- a project spearheaded by historian Kees Kaldenbach. See the "Made with Canoma" Quicktime movies and read how they were made. The Urban Simulation Laboratory at UCLA and "Virtual LA" - the future of urban planning, simulation, architectural review and emergency planning ? The University of Bologna, Italy, NUME project: visit the town center of Bologna in 3D - you can even change the year (between 1000 and 2000AD) and you will see buildings appear and disappear to give a historically accurate rendition. Townbuilder (in development by the Environmental Simulation Center), a geographic information system with realtime 3D visualization for architects, city planners, citizens.